Ti Lung is the warrior in A Warrior's Tragedy. The Skinny: Frankie Chan's epic masterpiece! Just kidding folks. Veteran actor Ti Lung does what he can in this sprawling swordplay epic, but an inconsistent tone, a poor performance in a lead role, and underdeveloped characters prevent A Warrior's Tragedy from becoming the genre classic that it could have been. If only the film had been put in the hands of a slightly more competent filmmaker. Based on a novel by Gu Long, Frankie Chan's A Warrior's Tragedy details the parallel stories of two warriors: one trained to love, the other to hate, both to be superior swordsman. On one side of this twisty tale of murder and revenge lies the dark and brooding Fu Hung-Suet (Ti Lung). Dressed from head to toe in basic black, Fu wanders from town to town, dispatching his enemies with his impressive ebony sabre. On the other end of the spectrum is the happy-go-lucky Yip Hoi (Frankie Chan), a cheeky, mustachioed fellow who dresses in white and happens to be a proficient martial artist. As one would expect, the two contrasting swordsman are locked on a proverbial collision course with destiny as both are invited to the home of the villainous Ma Hong-Kwan, who has a sinister connection to our heroes. Through flashbacks, we learn that twenty or so years prior to the events of the film, a swordsman named Pak was murdered by several assassins under the command of Ma Hong-Kwan. Apparently Pak was a bit of a ladies man, and to avenge his death, one of his lovers sent her only son to avenge his death. That son's identity? Fu Hung-Suet. Trained with only one purposethe annihilation of all those involved in Pak's deathFu becomes a morose killing machine, seemingly devoid of human emotions. Back in the "present day," Ma Hong-Kwan begins to worry that Pak's offspring might be blazing a trail of vengeance, so the elderly villain invites a group of young swordsmen to dinner in the hopes of exposing his future attacker. That night, one of the swordsmen is killed, and Fu Hung-Suet is framed (poorly, I might add) for the murder. Nice guy that he is, Yip Hoi turns into a kung fu Sherlock Holmes in order to flush out the real murderer. From that point forward (and some time before that, too), the story flies fast and furiously, introducing folks that are somehow connected to the plot. But since the film moves so quickly, there's little regard for character development. One just has to accept things as they happen, as the film builds to a (semi) shocking climax about the swordsman Pak and Fu's mission of vengeance. But don't worry, evil is punished, and everybody lives happily ever after. A Warrior's Tragedy is a mixed bag, to say the least. On the positive side of things, the film does maintain a fairly compelling visual style. From Fu's stylish battle in a snowstorm to the final duel with a warrior wearing a cloak of invisibility, the film is, at times, fun to watch. There's even a clever bit in which several characters imagine how much damage Fu Hung-Suet will do to an overzealous security guard before the warrior draws his weapon. Perhaps the best part of the film is Fu Hung-Suet himself. 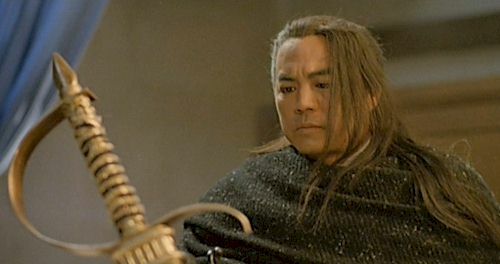 As portrayed by Ti Lung (and a fleet-footed stunt double), Fu comes across as an almost iconic character. His black outfit, icy demeanor, and noticeably gimpy leg make Fu stand out in a way that most generic good guys don't. Imbuing Fu with a sense of despair and longing that the narrative never explicitly establishes, Ti Lung does an excellent job in a role that was probably better suited to a younger actor. But even having said all that, the film could have been a lot better. As referred to earlier, the film contains too many characters whose agendas aren't adequately developed. Granted, this film was originally released as a single three-hour epic (trimmed down to 110 minutes for this DVD release), so perhaps that accounts for the lack of adequate character development. But even so, the truncated running time cannot adequately explain the jarring tonal shifts present in the film. And believe me, this movie is all over the place: Yip Hoi engages in a "cripple fight," there's some anachronistic Ben-Hur-style Roman chariots and plenty of Michael Bay-sized explosions to keep you awake (Sure, the Chinese invented gunpowder, but this is ridiculous!). But by far the worst part of A Warrior's Tragedy is Frankie Chan. Credited as director, writer producer, and star, Chan clearly created this film as a labor of love. Or perhaps, it was a chance to gratify his own ego. Whatever the reason, Frankie Chan just doesn't work well as a comic foil to Ti Lung. He's supposed to be the polar opposite of the stoic Fu Hung-Suet and inject some levity into otherwise serious proceedings, but his attempts at humor are limited to mugging for the camera and making lowbrow jokes. That's quite all right if the end result is funny, but that's not the case here. In the end, we are supposed to recognize that Yip Hoi is a greater hero than Fu Hung-Suet because the former uses his abilities to help, not to hurt. But really, would you trust a guy with such a sleazy mustache? That's not to say that humor isn't welcome in a film like this. For example, this sort of tonal flip-flopping works well in a film like The Duel, which has Nick Cheung (whose mustachioed sleaziness made sense for his character) and Zhao Wei ham it up while Andy Lau and Ekin Cheng played it absolutely straight as two heroes battling for martial arts supremacy. But in A Warrior's Tragedy, it just doesn't work. When a purported "epic film" ends with an AIDS joke and Ti Lung making a vulgar gesture, you know something's wrong.  The film's running time has varied over the years. Originally released in theaters as a three-hour epic, subsequent VHS releases have cut the film into two separate films. Three DVD versions are available. At 127 minutes, the Taiwanese (Mandarin-only) version put out by Thundermedia is the longest one currently available. The shortest is a 90-minute version distributed by Wide Sight. This review is based upon Winson's 110-minute cut.  There is 1989 TVB adaptation entitled "The Black Sabre," starring Eddie Cheung and Hugo Ng.